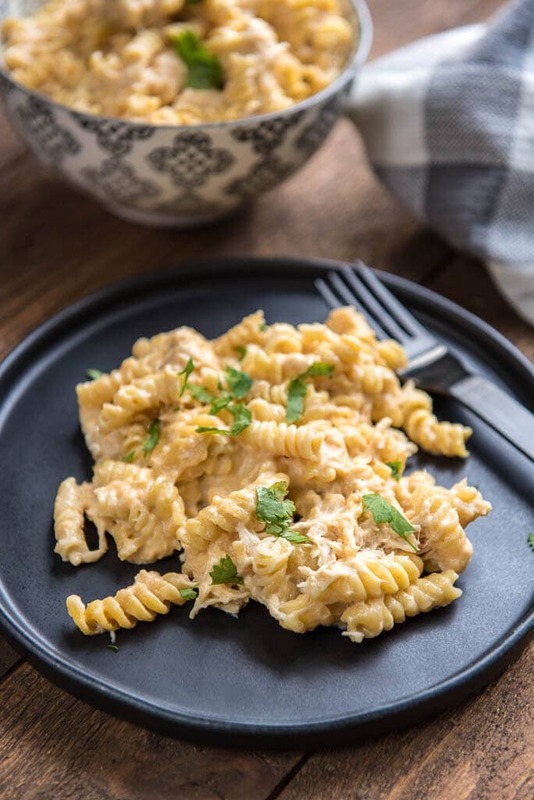 Slow Cooker Mac and Cheese is a simple and easy way to make totally homemade mac and cheese without a ton of work. Add garlic chicken to make it a filling meal the whole family will love. This is the perfect family meal, and because my family loves it so much I thought it was time to update the recipe!! I originally shared back in May 2014 and a recipe that’s still in rotation 3 years later certainly deserves some more love! 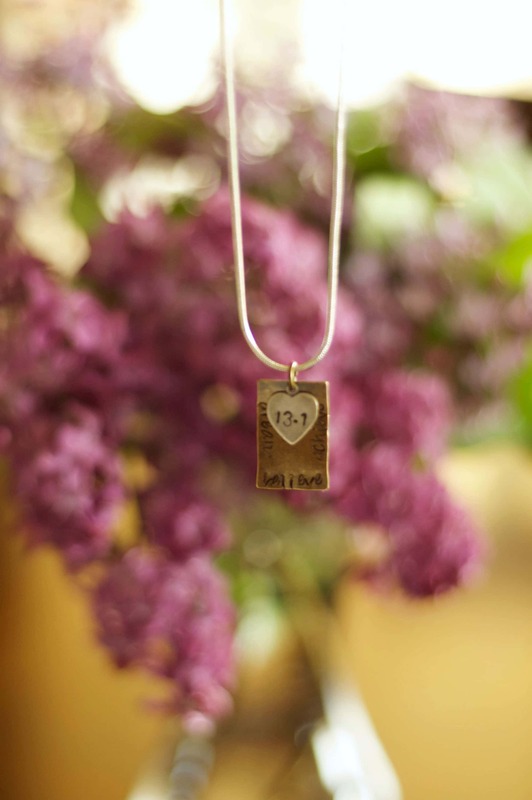 I first made this on a weekend when some girlfriends and I hit the road for a little trip that just happened to involve running at half marathon the last day. If you are interested in taking a trip back in time with me check out the rest of the post. 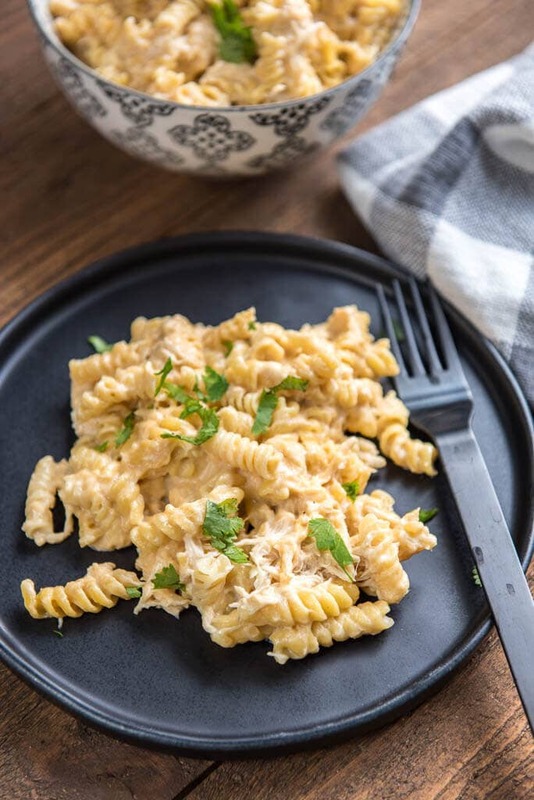 If not, just feel free to scroll on along and grab the recipe for this Slow Cooker Mac and Cheese with Garlic Chicken! Original post from May 6, 2014!! 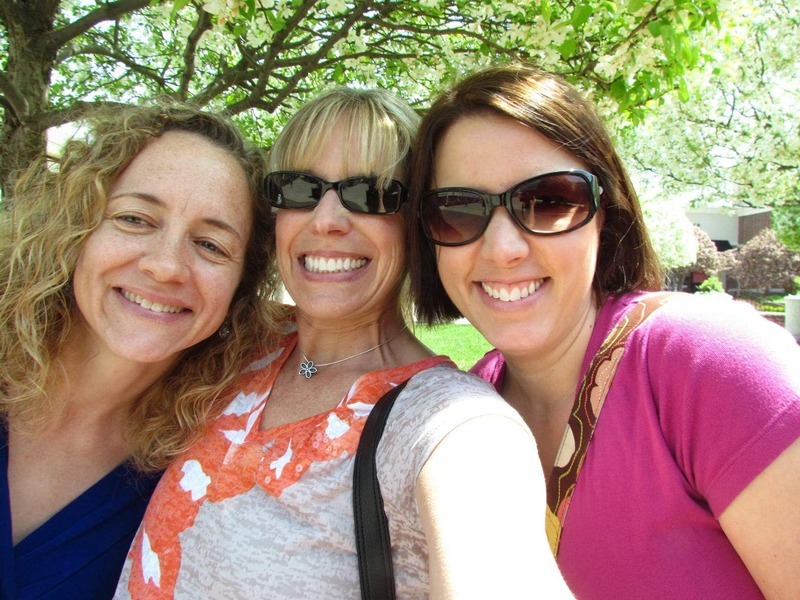 So good to get away and to spend more time with these lovely ladies! But more on that in a minute. First I want to tell you about this mac and cheese I made for my family before I left so that they could have full bellies and leftovers. 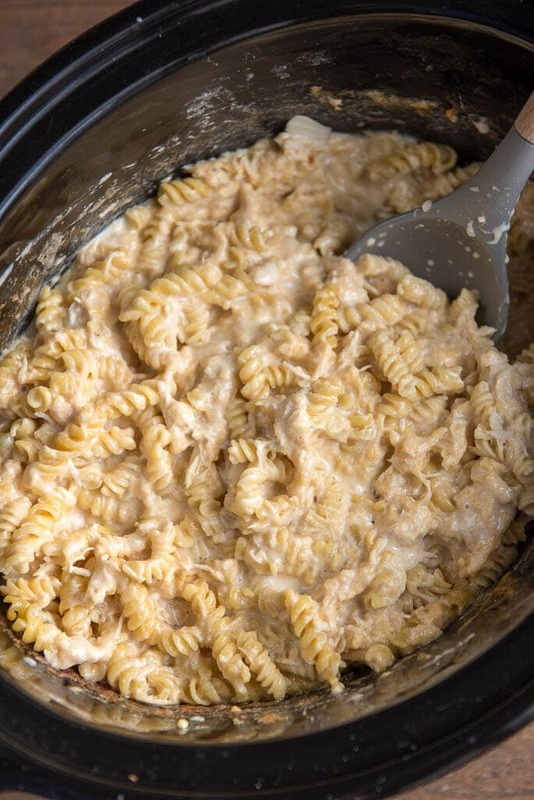 So easy to make and so creamy and delicious and uses REAL cheese! 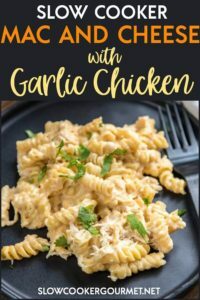 You will cook the chicken all day with lots of garlic and broth and then during the last 30-60 minutes add in the noodles and cheese. 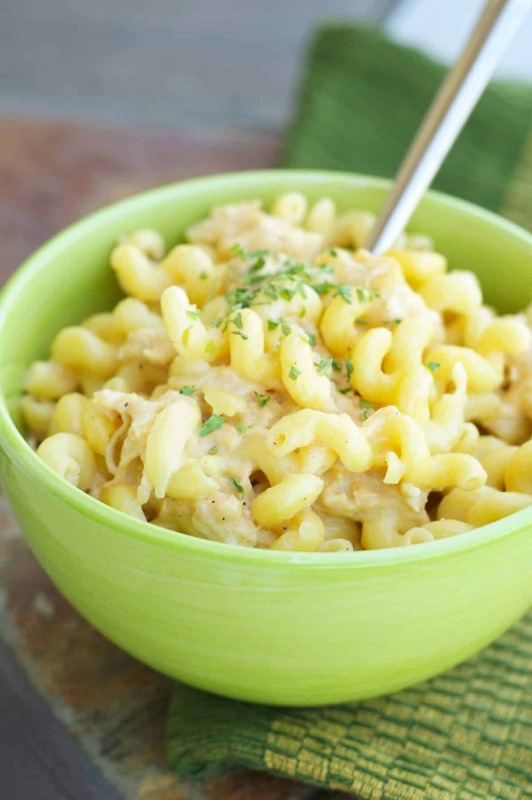 Very easy and so much better than boxed mac and cheese. Use any kind of cheese you like the most. I used a combo of sharp yellow cheddar and sharp white cheddar. I really like that extra bite of flavor. You will also use a little cream cheese to help smooth it all out and add that little extra richness. The richness of all that cheese is balanced out with the garlicky chicken. The whole family loved this and when I got home all the leftovers were gone too! Always the sign of a well received meal. Now more about the weekend and the race! We were able to hit the road on Friday night and had such a fun drive even running into another one of our friends traveling with her family at a stop along the way. Such a fun surprise! We were able to stay with the brother and sister-in-law of my friend and they were so lovely to host us! Blueberry pancakes and bacon for breakfast!!! And a lovely pre-race dinner made by her mom! Such a wonderful family! We did our best to document our trip in photos….But I never did get a food pic! I was too busy chowing down! Here is our attempt at a selfie. The weather was perfect all weekend. We were able to go to the race expo and catch a funny movie. So relaxing to laugh with your friends! Race day couldn’t have been more perfect. Nice and cool and a lovely course lined with lots of spectators cheering. The miles flew by and goals were met. Must do this all again soon! Now back to mac and cheese!! 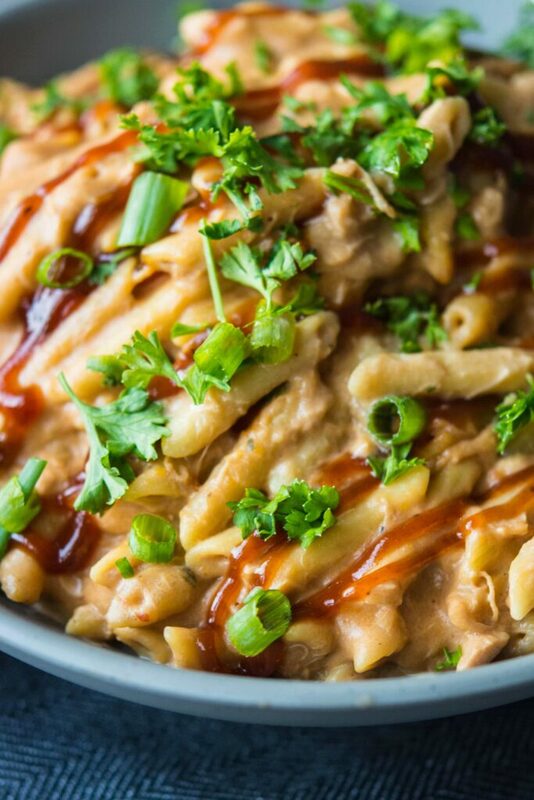 I mean, it’s not like we need a reason to enjoy Mac and Cheese, it’s just that making it from scratch has always been a lot of work, until we made it in the slow cooker! Pasta is done with liquid is absorbed and pasta is al dente (or softer if you prefer). You can more liquid if necessary adding 1/2 cup at a time. An extra splash of milk before serving will make it really creamy. Can I use frozen chicken breast, or is it best to use thawed? For food safety, it’s always best to use thawed meat in the slow cooker. Do i have to use cream cheese in the recipe? Or can i just use regular cheese and milk? You’ll need it to thicken the sauce in this recipe. You could try a cornstarch slurry, but I haven’t tested this yet so I’m not sure how it would turn out. I’ve made this before and it is DELICIOUS! I was wondering if it would be able to be made without the chicken? I’d leave all the other ingredients in, just wanted to make it as a side for a different protein (ribs – yum!). I don’t really want to search for/attempt a new recipe since I know this is super yummy. Any advice/thoughts? Yes, obviously you wouldn’t have to make it in the slow cooker without the chicken, but if you wanted to I’d just do everything without the chicken for an hour or two and then follow the remaining recipe as written. I’m so glad you love it!!! Will it cook okay if I halve the recipe? And would I just halve the cook time as well? The cooking time will be the same, you will just need to use a smaller slow cooker. Hi! The recipe sounds amazing. I’m looking to make something like this for a potluck at work tomorrow, but will need to sit in the crock for several hours. Any recommendations for that? I hate for it to get gummy, but really would like to make it! 🙂 I mean, it’s CHEESE!! Thanks! Just cooked this and it is awesome Jennifer. ….possibly one of the best things I’ve ever eaten! 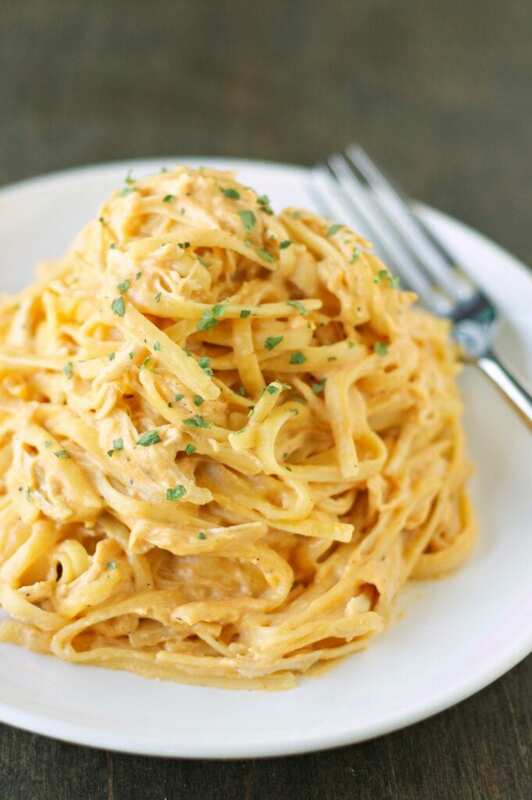 Hey, I was thinking about making this but doubling the chicken while keeping the same amount of pasta. Since the broth seems to be mostly for the pasta, do you think it would be best to still use 3 cups, or add a bit extra for the chicken? Yes, I would probably leave the broth the same and then just add a little as needed at the end to get the pasta fully cooked. The cream cheese just kind of helps smooth everything out and make more of a cheese sauce. I haven’t tried it but yes, maybe upping the butter and adding a little milk might help? But the sauce will probably be a bit thin compared to using the cream cheese. Do u know if I’m using penne, if a 12 oz box will be enough? Or should I use a box and a half?